(ONE heart | Global Breakthrough Energy Movement) Het is een groot genoegen om aan te kunnen kondigen dat Michael Tellinger in maart twee lezingen geeft in Nederland! Hij is schrijver van onder anderen "Slave Species of the Gods" en het pas verschenen "UBUNTU Contributionism". Deze onderzoeker en leider van de UBUNTU politieke partij verteld in zijn presentatie over herkomst van het menselijke ras, de manier waarop deze oude kennis uit de bekende geschiedschrijving verbannen is en de technologie welke samen met de oude kennis van onze verre voorouderen verloren is gegaan. Op 15 maart geeft hij een presentatie in Amsterdam en op 20 maart in Groningen. Not to be missed! Long before the Egyptians saw the light of day, an advanced civilisation of humans lived in southern Africa mining gold. These were also the people who carved the first Horus bird, the first Sphinx, built the first Pyramids and built an accurate stone calendar right in the heart of it all. Adam’s Calendar is the flagship among millions of circular stone ruins, ancient channells, agricultural terraces and thousands of ancient mines, left behind by the Anunnaki and a vanished civilisation which we now call the FIRST PEOPLE. Michael will cover the following subjects in his presentations and workshops. These mysterious people left behind more than 10 million stone ruins scattered throughout southern Africa. They carved detailed images into the hardest rock, worshipped the sun, and were probably the first to carve an image of the Egyptian Ankh – key of life and universal knowledge, 200,000 years before the Egyptians came to light. Michael reveals many of the latest scientific measurements and presents the evidence that this vanished civilisation had an astute knowledge of the laws of nature and the generation of FREE ENERGY from Mother Earth for all their needs. They used the power of sound and frequency as a source of energy, which underpins the scientific conclusions reached by Tellinger. In his humble museum in the heart of this ancient city, Michael has collected a staggering display of unexplained tools and artefacts that have never been understood before, and presents the evidence of advanced technology by the ancients. Michael’s work touches critical issues around the subject of Unity Consciousness. “The more we push the boundaries of science, the more we come to understand the universal mind – the creative source of all things in the multiverse and beyond. It seems that the knowledge we gain from quantum physics and space-time studies, brings us closer to understanding the true nature of reality, the meaning of the universe and our place in it as conscious beings.” Michael believes that quantum physics is a gift from the divine creator to allow humanity to find its way back to source – back to unity – from a deeply divided and manipulated species – not only on Earth but in the entire universe. In his book Temples Of The African Gods and African Temples of The Anunnaki, he graphically exposes his discoveries that will be the catalyst for rewriting our ancient human history and provides the physical evidence for much of Zecharia Sitchin’s work. Tellinger’s books, which also include Slave Species of god(Slave Species of The Gods) and Adam’s Calendar have become favourites with readers in over 30 countries. Only by understanding our mysterious past, the origins of money and the rise of the royal bloodlines, can we make sense of where we are heading today. Why life is so hard and why we have to struggle so much to stay alive. Tellinger presents a model for a new social structure called CONTRIBUTIONISM – A World Without Money – based on the African philosophy of UBUNTU and proposes how we should move from a money-driven society to a society driven by people, their talents and their passion for life. Where everyone contributes their natural talents or acquired skills to the greatest benefit of all in their community – and money has no meaning. Tellinger has been one of the leading activists against the banking cartels in South Africa since 2010 and his personal experiences in the High Court has helped him to expose the unlawful and corrupt banking sector. His new book UBUNTU Contributionism – A Blueprint For Human Prosperity, was released in Feb 2014 and contains detailed information and guidelines how humanity can achieve UTOPIA on this beautiful planet of abundance. 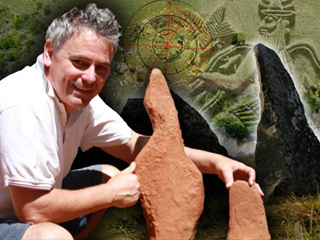 Michael Tellinger is a scientist, explorer and internationally acclaimed author of numerous books, namely Slave Species Of god; Adam's Calendar; Temples of The African Gods; and UBUNTU Contributionism – A Blueprint For Human Prosperity. He has become an authority on the vanished civilisations of southern Africa and the origins of humankind. His research and discoveries of an advanced vanished civilisation in South Africa includes a diverse field of research and touches on human origins, spirituality, science & consciousness. His continued efforts and analytical scientific approach have produced physical evidence to support the translations of the Sumerian tablets and Zecharia Sitchin’s writings and delivers proof of the presence of the ANUNNAKI and their ancient gold mining activity in southern Africa. Michael’s work will force us to rethink our origins and rewrite our history books. He is the founder of the UBUNTU Liberation Movement and the UBUNTU Party that will be contesting the elections in South Africa in 2014. Wil je de lezing graag bijwonen maar kun je het niet betalen? Voor de minima zijn er elke lezing 2 gratis kaarten beschikbaar (maximaal 1 kaart per persoon per jaar).